Red blood cells on an agar plate are used to diagnose infection. 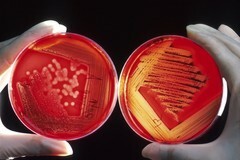 The plate on the left shows a positive staphyloccus infection. The plate on the right shows a positive streptococcus infection and with the halo effect shows specifically a beta-hemolytic group A. Both plates are being held by a gloved technicians hands. These infections can occur in patients on chemotherapy.